Today Pluralsight published my new course, “SQL Server: Transact-SQL Common Table Expressions”. What are CTEs and Why Use Them? Much more to come from the SQLskills team! While this shows up for the SQL Server 2005 topic, there is no such statement made for the 2008 and 2012 versions of the the books online topic. Table ‘ProductDescription’. Scan count 0, logical reads 28, physical reads 0, read-ahead reads 0, lob logical reads 0, lob physical reads 0, lob read-ahead reads 0. The operators remained the same, but we have a change in estimated subtree cost and also a doubling up of cardinality estimates. Table ‘ProductDescription’. Scan count 0, logical reads 34, physical reads 0, read-ahead reads 0, lob logical reads 0, lob physical reads 0, lob read-ahead reads 0. Logical reads were 34 versus the original 28. I found that with the combined CONTAINS, the plan shape for this example remained the same as the multiple-CONTAINS version. Operator costs and estimates also remained the same. For SQL Server 2005, if you had multiple CONTAINS predicates referencing columns from the same table, your execution plan would show separate remote scan operators for each reference instead of them being combined natively into a single operator. This behavior seems to have been addressed in recent versions, but if you have seen a variation of this issue given other conditions please share in the comments. Thanks! Based on this output, we know a SQL Server Agent Job is involved, but what is the SQL Server Agent Job name? I’ve forgotten about this twice over time because the job_id uses a uniqueidentifier data type (in this example, the job_id value is 6CB913B8-E659-4C00-A8CD-542D8A431A2E). And as an aside, the query execution plan shows a CONVERT_IMPLICIT as I would expect and uses a Clustered Index Seek. This post, like the previous nine posts on this subject, uses SQL Server 2014 CTP2 as a reference point. There may be changes by SQL Server 2014 RTM, and if so, I’ll write a post about applicable changes. Now in terms of troubleshooting the new Cardinality Estimator, what I’m specifically referring to is the introduction of cardinality estimate skews that negatively impact query performance compared to the pre-SQL Server 2014 cardinality estimator functionality. Ideally performance regressions should be rare, but when they happen, what are our troubleshooting options? So what troubleshooting methods and options are available to us? Are the statistics old and need updating? Should the statistics sampling be changed? Are multi-column stats needed to help establish a correlation where one currently isn’t seen by the query optimizer? Is your table variable usage contributing to the skew? Is your multi-statement table-valued function or scalar user-defined function contributing to the skew? Any data-type conversions occurring for predicates (join or filter)? Are you comparing column values from the same table? Is your column reference being buried by a function or embedded in a complex expression? Are hints being used and if so, is their usage appropriate? The new CE story will unfold as customers start upgrading to SQL Server 2014 and I’ll be curious to see which regression patterns are most common. Regarding the new query_optimizer_estimate_cardinality XE event… Will it be a practical source of information for most SQL Server users in cardinality estimator skew regression scenarios – or will it be something reserved for edge-cases and advanced Microsoft customer support scenarios? I suspect this XE event will have limited applicability, but I’m reserving judgment for now. Will SQL Server 2014 RTM introduce finer-grained methods for reverting to the pre-2014 cardinality estimator? How will the new CE behave with newer functionality? For example, Hekaton and clustered columnstore indexes. Will this be it for CE changes for the next few versions? There is plenty left on the CE-improvement wish list, so I hope not. In previous posts for this series, I discussed how the assumption of independence with regards to multiple predicates against the same table, in absence of multi-column stats, is blunted a bit with the new Cardinality Estimator for SQL Server 2014. So your estimates may increase for this scenario. On the flip-side, when it comes to joins between two tables, you may see a reduction in join estimate values for scenarios where there are non-join filter predicates on the tables being joined. We see that the estimates are spot-on for the Clustered Index Scan and Table Scan, but we have an over-estimate for the Hash Match operation (1,767 estimated vs. 1,003 actual). 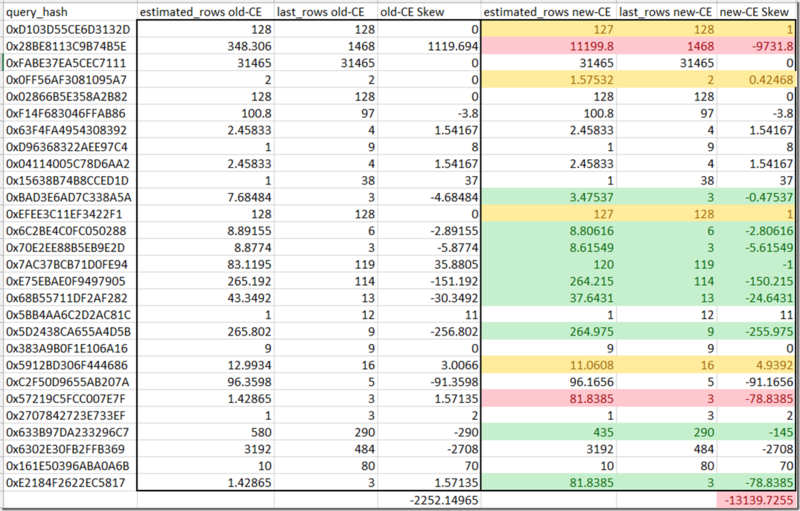 We still have identical estimate vs. actual values for the Clustered Index Scan and Table Scan, and now our over-estimate for the Hash Match is less pronounced (1,140 rows estimated instead of the 1,767 rows previously estimated). For the pre-SQL Server 2014 cardinality estimation process, the assumption is that the non-join predicates for the two tables are somehow correlated (in our example, region_no = 2 and payment_dt = ‘1999-09-02 00:00:00.000’). This is called “Simple Containment”. For the new Cardinality Estimator, these non-join predicates are assumed to be independent (called “Base Containment”), and so this can translate into a reduced row estimate for the join. I changed the database to the latest version so we use the new CE and then added four new columns. Now what about a query with three predicates, with selectivities of 0.1, 0.5 and 0.25? The selectivities are ordered from most selective to least selective, and the the less selective values get the “back offs” in order of none, 1/2, 1/4, and 1/8. Today Pluralsight published my new course, “SQL Server: Database Creation, Configuration, and Alteration”. There are now 29 courses from the SQLskills team as of today and much more to come. In the previous post, I looked at root-level cardinality estimates vs. actual row counts across a set of 28 queries). 9 plans had improved cardinality but two of them had significant changes. One of the plans for the new CE version had a root-level estimate of 11,199 rows vs. 1,468 actual rows. Compare that to the original estimate of 348 vs. 1,468. You can see that at the leaf-level, the Cluster Index Scan estimates remain the same, as does the consecutive Compute Scalar. Where it changes is in the Hash Match (Aggregate) operator – with the new CE estimating 11,200 rows versus the old estimate of 348. Aside from the standard methods of evaluating single-column statistics (do they exist, are they up to date, do I need to change the sampling) – I then wondered if some of the legacy methods for helping improve estimates would still apply? For example, would adding a calculated column help? 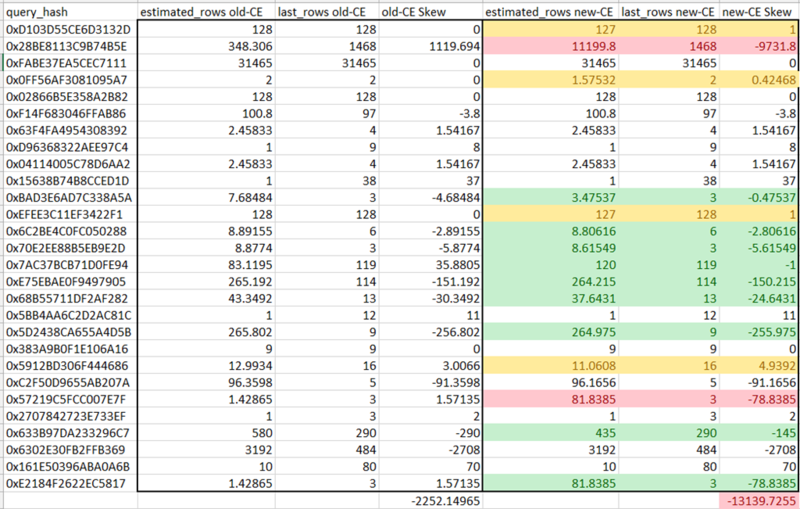 I wish I could look at the query_optimizer_estimate_cardinality results for the old version of the CE to compare the event output to the new CE. I know it isn’t possible, but it would have been more helpful to understand what changed regarding the Hash Match (Aggregate) estimate. As an aside, the exact math behind the estimates are hidden both in the new and old versions – so perhaps a comparison of calculators in this scenario would still be limited? The stats collection was interesting to me as it was our first appearance out of the 12 events of the GROUP BY estimate – 11,199.81 (show earlier in the plan tree rounded up). The loaded stats StatsId of 5 was for the UnitPrice column and the StatsId of 6 was for the OrderQty column. So we see that with skews introduced in the new CE – similar to previous versions and depending on the query and schema, multi-column stats and calculated columns can still be helpful in reducing the CE skew. In this post I just wanted to step back and discuss how to enable and identify the Cardinality Estimator version, at least as it stands in SQL Server 2014 CTP2. And I saw that value of 70 for compatibility levels 110 (SQL Server 2012), 100 (SQL Server 2008), and 90 (SQL Server 2005). Perhaps this indicates that the cardinality estimation model being used pre-SQL Server 2014 CTP2 had its last major change back in the (70) SQL Server 7.0 days. Just a guess though.